<!- - CONTENT- - > "death rates from hepatitis C alone are expected to surpass those of AIDS in a few decades. " The United Nations is in the process of defining a post-2015 development agenda. This agenda will be launched at a Summit in September 2015, which is the target date for realizing the MDGs. It is currently being elaborated through informal consultations of the UN General Assembly. The President of the General Assembly has appointed two Co-facilitators to lead those informal consultations. The process of arriving at the post 2015 development agenda is Member State-led with broad participation from Major Groups and other civil society stakeholders. Globally, viral hepatitis kills an estimated 1.5 million people each year - a death toll comparable to HIV/AIDS. The chronic disease caused by hepatitis B and C viruses accounts for 78 per cent of all cases of liver cancer, which is the second most common cause of cancer deaths after lung cancer. 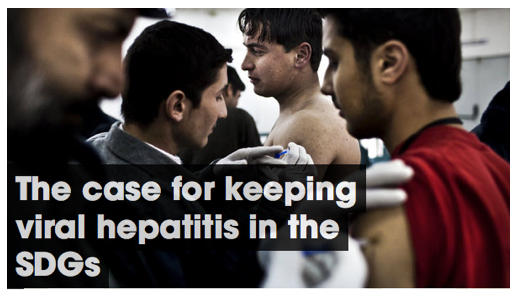 Despite this high burden, hepatitis wasn't included in the Millennium Development Goals (MDGs) agreed in 2000. Jennifer Johnston, executive director of the Coalition to Eradicate Viral Hepatitis in Asia Pacific (CEVHAP), tells me that this was partly because viral hepatitis is largely a silent infection - the majority of those who contract it show no symptoms in the early stages of infection. People can live for decades with the infection having little impact on their health until it has developed into cirrhosis or liver cancer; and by then, the options for treatment are limited. Johnston adds that evidence about the disease's substantial economic impact has only begun to emerge in the last few years. Crucially, strong evidence about the connection between viral hepatitis and liver cancer was unavailable when the MDGs were being discussed. This lack of global attention and urgency has resulted in several countries making very little investment in the coordinated action needed to address hepatitis. But now the world is fully aware of how dangerous and costly the disease is - and it's time to take it seriously. However, there are 180 potential SDG targets under discussion, with each vying for attention. So hepatitis might again be left out of the final version. In that scenario, the Asia-Pacific region stands to lose the most. For reasons that are still unclear, the region shoulders the overwhelming share of the world's burden of viral hepatitis. It accounts for an estimated 70 per cent of the global death toll, or about a million people. Over 100 million people are estimated to be infected with chronic hepatitis B. Countries in South-East Asia also report high rates of mother-to-child transmission. According to Johnston, when children are exposed to viral hepatitis before the age of five, there is an 80 per cent chance of the disease developing and causing liver damage later in life. In addition, many of those infected cannot afford the healthcare they need. According to one study, the cost in China of treating infections that lead to cancer that starts in the liver ranged from US$3,000 to US$11,000 per person admitted to hospital for at least a week. This corresponds to up to four times the average annual household income in the sample - and even with health insurance, direct out-of-pocket costs exceeded 40 per cent of the patient's disposable income. Joel Adriano is regional coordinator of SciDev.Net's South-East Asia & Pacific edition.